Months of planning finally ended when the first of four MTU12V 4000 M73 engines from the M.V. Napa was wheeled into our Kent shop and the team of technicians descended upon the piece of machinery. The arrival of the engine marked the start of a five-week project where we simultaneously rebuilt each of the four engines from the ferry operated by Golden Gate Ferries. This time we videotaped the entire process. “This is the fourth time we’ve tackled a rebuild project on a ferry boat’s entire propulsion system,” said Dan Miller, the service manager who oversaw the project. “It’s a lot of six-day work weeks, but the guys like the challenge. Before the engines arrived at our shop in Kent, WA, Miller and his team spent hundreds of hours preparing for the work. Parts needed to be priced and ordered. Space in the shop needed to be cleared. Technicians needed to be assigned to teams. “The bulk of the work is clearly handled by the techs, but it takes our entire office to pull off these rebuilds,” Miller said. A lead technician was assigned to a pair of engines and oversees a group of specialists. Golden Gate Ferries was proactive in ordering the rebuilds as soon as the engines reached the end of the life cycle mandated by the number of hours in operation. Each engine was meticulously disassembled and each part checked for its potential reuse. This is also the time when plans are readjusted as the project goes from assumed needs for the engine to reality. “Each engine has 700-line items and until we break each engine down we don’t know exactly what needs to be replaced,” Miller said. 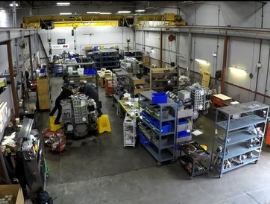 The build process is typically phased so that techs begin rebuilding the engines that require the least amount of work. This allows for work that needs to be handled outside the shop, time to be sent out and returned. This isn’t the first or last time Miller’s team has worked on Golden Gate’s vessels. The M.V. Mendocino was overhauled in May 2018. M.V. Del Norte’s engines arrive in March. Our reputation for working with the Bay Area ferry system has allowed us favored status with not only the ferry operators but MTU. A recent agreement reached by all three parties has allowed us to expand our service capabilities by setting up a service operation that is outside our normal area of operations. Miller said MTU readily acknowledged the PPG team can handle the engine rebuilds faster than their factory. That is a point of pride for our techs.